A few months ago I wrote about my adventures in guilt-free baking and shared the recipe for my ‘paleo’ brownies. Since then I’ve had plenty of opportunity to explore the world of sugar-free baking. While there have been a few typical baking experimentation disasters, I’ve been super excited about the results. What is the easiest way to make your baking healthier? It’s easy. Just replace the sugar in your favourite recipe with a good quality natural sweetener. The trick is finding the right natural sweetener. What’s the best natural sweetener? I’ve had the most success with a blend of both erythritol AND stevia. Erythritol is a sugar alcohol which provides the physical properties of sugar. But it isn’t as sweet. Stevia is an extract from herbs which is much sweeter than sugar so it provides the sweetening. The thing to note with stevia is that a little goes a long way. The ideal amount will vary from recipe to recipe. I’ve had the most success by replacing half the sugar by weight with an erythritol / stevia blend. For example in the banana bread recipe below, I’d use 200g (7oz) sugar OR 100g (3.5oz) erythritol / stevia blend. Where can I find an Eythrtiol / Stevia blend? Check the ingredients list to make sure it contains erythritol AND stevia. I’ve been using ‘Natvia’ brand and have also heard good things about ‘Truvia’. Let your favourite search engine do the work! This is the most cost effective option. Just buy erythritol and stevia separately either online or off. Then combine 180g (6 1/3oz or 1cup) erythritol with 1/2 teaspoon stevia (Thanks to Jenna for the link to Healthy Indulgences for the inspiration for a DIY option). In a word cost. With sugar so cheap, stevia / erythritol blends are super expensive by comparison. But remember you’ll only be using half as much so it’s not as drastic as you’d first think. And I like to think about the longer term savings to my health. Looking for more sugar-free baking recipes? 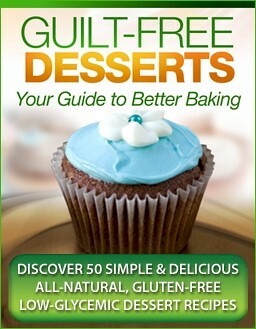 If you’re looking for ways to make your baking a little healthier, I highly recommend having a look at ‘Guilt-Free Desserts‘ by Kelley Herring. Adapted from the ‘banana and walnut muffins’ in Guilt-Free Desserts by Kelley Herring. 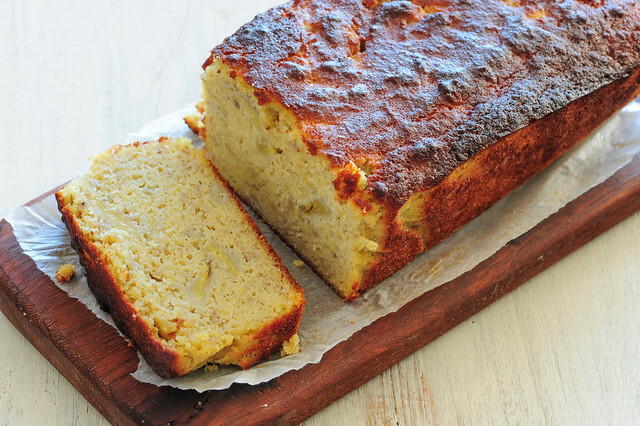 This banana ‘bread’ is super moist and really more at the cake end of the spectrum – but don’t let that stop you having a slice toasted with fresh ricotta for breakfast. The brand of natural sweetener I’ve been using is called ‘Natvia’ and it’s actually a blend of stevia and erythritol. If you can’t find it you could use plain erythritol and a few drops of liquid stevia. But if you can’t find any of those, best to just use sugar – see variations below. 1. Preheat oven to 180C (350F). Line a small loaf pan with baking paper. 2. Peel and mash bananas. Combine with butter, eggs and the erythtirol / stevia blend. 3. Whisk in the coconut flour and baking powder. Transfer to your prepared load pan. 4. Bake for 40 minutes or until the ‘bread’ is well browned and feels firm and springy. real sugar – replace stevia / erythritol blend with 200g (7oz) brown or white sugar. dairy-free – replace butter with a neutral flavoured oil. Macadamia oil is great if you can find it. egg-free / vegan – Sorry! I’m afraid you really need the eggs to provide protein not available in coconut flour. can’t find coconut flour? – I haven’t tried this, but if I was going to use regular wheat flour I’d reduce the eggs to 3 and use 250g (9oz) plain flour or almond meal instead of the coconut flour. nuts! – feel free to add in a few handfuls of roasted walnuts, pecans or brazil nuts. I’m starting on my paleo adventure and am planning on experimenting on this banana bread. (Made the coconut one). I noticed this recipe uses butter while most others online do not. Just curious as to what effect butter has on bread vs. not using. (Not worried about the fat). Thanks. Thanks Jules, just happen to have a couple of overripe bananas! Kids might like this one! Can you explain to me the benefit of using erithrytol instead of sugar? I can understand the logic behind reducing the use of sugar, but replacing it with an alcohol is an approach I’ve never heard of, and it seems strange – I’ve never heard of erithrytol, but I know ethanol (drinking alcohol) is very calorific, more so than sugar, and is metabolised very quickly, playing merry hell with blood sugar and insulin levels in the process. Is this true of other alcohols, and if so, what’s the advantage? Me encanta este sitio. Lo que ocurre es que no entiendo nada. I made this receipe exactly as stated over the weekend and it is fantastic. I will certainly be making it again. I might even be able to get the husband to eat it, providing I tell him it has something other than bananas of course!!! you might try pumpkin instead of bananas. and here in the US either banana bread or pumpkin bread are often made with sweet spices so that could make a nice variant. Is it possible to use honey instead of stevia? Lex, anything is POSSIBLE. LOL Honey is sweeter than sugar so take the sugar measurement by volume and use between half or up to 2/3 of that amount in honey. Honey is also liquid so you might need one less egg, or a bit more flour. Can this be made in a cast iron skillet and baked? I know some recipes have to be altered to account for being cooked in a Dutch oven. You probably could Meilssanne.. but I have no idea how you’d need to adjust the cooking time… Do let me know if you try it! I tried making this vegan with flax eggs and it works! And they add a lot of usable vegan protein and omega 3s… just google how to substitute ground flax seeds for eggs, very easy substitution! thank you for your great recipes! Here’s a link if you need a primer on how to make flax eggs! OMG! Have been doing LCHF for the past 10 weeks and need something to fuel my longer runs…I think this bread will do the trick nicely, just the right amount of carbs but NO wheat! Thank you!